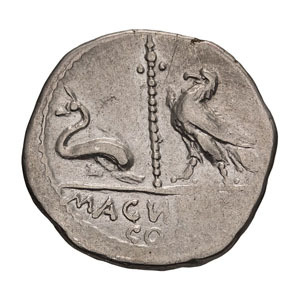 Ancient Imitation of Pompey the Great, (prototype struck by Varro, proquaestor). 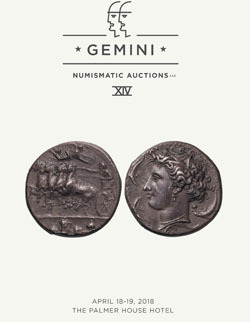 Denarius, 3.62gg. (7h). , after 49 BC. 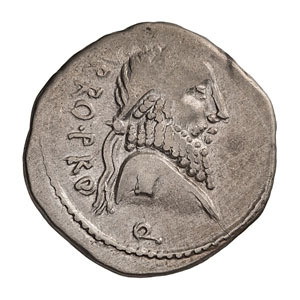 Obv:[V]ARRO PRO Q Terminal bust of Jupiter right, diademed. Rx: Upright scepter between dolphin right and eagle standing left; MAGN (N retrograde) [PRO]/CO[S] in two lines in exergue. Cf. Crawford 447/1a. Cf. Sydenham 1033. Cf. Sear, Imperators 8. aEF; area of flat strike.